So it was, an early 5.30am start, Zombiepirate and I started the long journey to the sunny south of London.Leaving the rain behind us we had the additional excitement of erratic navigation and traffic in the centre of London, always a treat. So with a bit of a chat to Dave and the guys from Shellcase we moved into the game room. The table was setup with two forces, the United Colonies of Mankind (UCM) and The Scourge. Both of which happened to have been the large armies as available for pre-order from Hawk Wargames; as well as a host of buildings also from Dave. The buildings were lavishly painted and lots of complementary “Ohhhs” and “Ahhhs” were made as we looked over the exquisite design and painting. Then we looked over the miniatures for the army we would be using for the days games. There was a colour coding system that Dave explained would help us with which units belonged to which command group. These were done with good old round stickers but as ZombiePirate pointed out he would add a trim colour to his units to have the same effect (see he’s bought them already hehe.). Dave spent some time going over each combat group and how they work and the basics of deployment and the game turns, initiative etc. We broke into two groups for the game, a member of 6inchmove and the Shellcase on both sides. Phil and I ended up on the side of The Scourge and ZombiePirate and Lee were on the UCM side, Phil and I were both looking at getting the PHR force, which sat on the side looking at us all lovingly but these were the sides we started with for this game. ZombiePirate got a chance to play his beloved UCM so he now has an unfair advantage when he plays me, which I shall use as a defence if I lose! We had 2 medium dropships each carrying 2 APCs each with 3 units of infantry, human souls converted to work for The Scourge. One large dropship which carried the armour combat group consisting of 6 MBT tanks and 3 AA tanks. Two light dropships that were part of the command combat group that carried the 8 light AA floating blimps, best description and the awesome commander himself in the Desolator! We also had two ground attack fighters. We went first and chose to deploy the dropship carrying the medium infantry, these rushed on a good distance and deployed the APCs which were able to go a little further and so did the infantry and got into the building, the UMC tried the same, our second unit tried the same and fell short. So this is how the first turn went, a scramble to get towards or into the objectives and get the heavy, slower dropships as far forward as possible to protect the force. The lighter AA ones went further to cover the heavy’s etc. This was matched by the UMC which moved less but managed to get to similar points. The game progressed with the infantry trying to get hold and leave with objectives, armour providing anti-armour and fire support, AA fending off dropships and aircraft and setting up no-go zones. APC’s laden with a precious cargo of infantry and objectives trying to leave the table, we never thought about using our dropships to pick them back up! That is at a guess the crux of the game and my initial thoughts about why dropships and 50% of your army are useless dropships and taking no further part in the game proved that it’s just not true! Dropships unsurprisingly in a game called DropZone Commander are essential. Not only do they allow a flexible deployment, or the ability to move across the table to get to objectives, they allow you to also pick combat groups back up and move them from point to point or even move them off table to return later! This gives you a fantastically flexible game which keeps your opponent constantly assessing where you may or may not plan to strike and almost forces him to deploy forces to setup zones of control with AA and other assets. Infantry are key to the game; you may think that dropships would be, but infantry are the only units that can capture objectives, protect them at all times! Another point, infantry in the open equals dead infantry! Close combat is devastating, at least it was in our game and Dave explained that it’s meant to be that way, short, brutal engagements. Remember though that I think Dave said 40% or 50% of the cards are for close combat, so watch out for the enemy pulling a card on you that can swing combat their way, this happened to us, we thought we had the upper hand and the opposition played a card to stop them and gave us a good kicking. APCs move your infantry around quickly and offer your infantry some element of protection from the devastating firepower blasting all over the battlefield. Protect the APCs as best as you can or use a driopship to move them around quickly. I can see buildings being an important part of the game and as such that is one reason Dave went for 10mm. As previously mentioned N scale is close to 10mm so you can get cheap railway buildings if you shop around, Dave is producing some of the most amazing resin buildings which will be available soon. However if the price of those or the thought of that makes you shiver Dave has thoughts in mind to make them more accessible and cheaper, more than that I cannot say, but stay tuned! While our armour died a horrible death, due to great tactics by the UCM players, these are your heavy hitters and if you have not got many targets to hit, buildings can be a good target for them. Remove the enemy armour and then concentrate on the enemy APCs! Anti-air assets are very important, some units are only AA based and other have a ground attack weapon as well, AA units can ONLY attack air units, I guess this seems like a problem, but there was so much stuff zipping around the board there is always something for them to have a pop at. Their key though is area denial IMO, preventing air strikes and defending against interceptors! Don’t leave home without them. So you want to make a bombing run or strafing attack, yep not a problem. Draw a line from one point on the table to another, crossing over your objective, sounds familiar and works well. Roll to see if you turn up, HA! Not ours! We rolled ones all day. See what AA assets are in the area and in range before you attack and see the results, make your attack and then see what AA may catch you on the way out! Sounds simple and it is, then add to this interceptors cutting your line of approach and now you have a problem. Not a game problem or rules, but watching your carefully planned ground strike unfurl before your eyes. In our game we used the army commanders that came with the large army deals. The UCM have the Kodiak ACV and The Scourge have the awesome Desolator. The Kodiak has a nice little strike package that UCM players will love and the Desolator is an incredible war chariot for the Scourge commander who can shoot a direct weapon at short range and a devastating electrical weapon with a huge template! I would recommend every army fear this weapon, nothing could be worse than fighting two of these beasts; thankfully there is only one in the army and that includes the Mega army. There are no scouts for The Scourge that we used (they are available) but the UCM scouts we thought would be useless proved to be a right thorn in our side, sniping away and directing the UCM army commander’s strikes. Never underestimate these scouts, they maybe lightly armoured and easy to kill but if you don’t have the assets to deal with them they can cause you all sorts of issues, their AA guns took down one of our drop ships and AA cover. Little pain in the arses! I did worry about the addition of the cards. Cards can be a good thing but, it seems mostly they allow players to over stack a situation or break rules (Spartan anyone?) gladly these didn’t. We sat around while Dave put some dinner in the oven (nice bloke Dave) and read through them, there are humorous quips on the cards but over all as we read some of them out to each other there seemed to be a balance to them all and nothing stood out as being too powerful. I would like to point out though, I/we did not read them all and you don’t get their game implications by just reading them, Dave told us that he spent a lot of time working on them and hates games with cards that affect the overall balance of the game, which was good to hear. I can see them being a handy addition to the game but not a dreaded game changer. Well, worried would be a word I used a lot prior to the play test, worried that these amazing miniatures could be let down by mediocre or even bad rules and I would have to hunt down a suitable set as a replacement. Let me just say right now, I personally have no worries about the game or the rules. Yes there are a few tweaks to be made prior to release, as there always are, but I think Dave hit the last coffin in the whole rules doubt when we talked at length about how rules sometimes need changes or to address un-foreseen issues after or prior to release, Dave explained that was one of his biggest bugbears about systems. The fact you bought a game or rule set and it was not supported by the designer/writer or if it was it would take a long time for them to be addressed. I get the impression that Dave would use his site not only for the growing FAQ’s and rule changes but spend a day with his many customers like he did on Facebook helping the gaming community understand and address any issues. Couple with that his support he offers to us mere bloggers and what he allows us publish. The game is a true combined wargame, your army and its composition will only be as good as the forces you’re using in combinations with each other. Getting an effective balance of ground units, AA and infantry for objectives is essential. Moving those assets around and getting them setup in time to provide cover, attack or defence is the key. Throwing all your forces into a meat grinder will throw them away against an opponent who utilises the correct force on force. Add in the great way interceptors add a new dimension and unknown factor to the developing game and strategy coupled with the very well thought out command cards can help to give you an edge but it is a double edged sword, as your opponent can pull these same things against you. Question from Matthew: Is there any chance of a release of quick play rules, or a battle report, game demo or something to get an idea of what we are expecting from the rules? Question from Chris: I own a small game store in Canada and my customers are loving the models but will not order anything till they have a basic idea about the rules. Hawk Wargames Chris: I quite understand! Take a look at the FAQ’s on the site if you haven’t already. Also, there should be a lot more answers for people by the end of the day! Question from Yeah Right: Hello,What is the basic dice size for DZC D6,D10? Question from Jens: Hi Dave, I wanna buy a Premium Shaltari Large Army and have 2 Questions: 1) Is that whole group of models (good) playable? Or, for example, are there too many medium dropships in that army deal for a normal game? 2) How many Foams are in this army deal? Thanks! Question from Alexander: Morning good sir! Congatulations on creating some of the coolest miniatures I have yet to see! On to my question: I was wondering about the basic rules mechanic, e.g. will there be opposed or “target number”-type rolls, or maybe a mix of both? Secondly, could you give us a sneak-peek of a stat-line for a unit, just to get a feel for the complexity of the make-up of a unit? Hawk Wargames Alexander: Thanks! It’ll be ‘target number@ (eg 4+) most of the time. Actually, the very first ‘rules chunk’ download will be a sample stat line, so you won’t have to wait long for that one! Question from Rob: Second Q: in terms of scenery, what density works best? The pics you have online look fairly well-packed, is this just for the benefit of lovely pictures, or does the game work best with that amount of terrain/buildings? Hawk Wargames Rob: Q1- You can play on an open battlefield sometimes, but that isn’t really the sort of setting the game was written for. At least 3 structures and plenty of obstacles works well (more fire and manoeuvre!) We’ve been playing with 10 ish buildings, but you don’t have to have that many! Q2- The modular scenery will be available later in the year (going into moulds right now!) Other scenery may be available sooner.. Question from Chad: Will there be a scenario builder or just pregenerated scenarios? Question from Patrick: Good morning Dave, some more questions: Do you already have a German Retailer? Any Chance of getting some rule-previews only for people who have preordered the rulebook? Question from James: Firstly can I say congratulations on the monumental task of bringing this game to fruition! Kudos! Are there any plans for an “Entry Level” pack? Many people have commented the high start up cost, I for one will likely have to buy 2 armies and the rules and £150 for entry level is steep. I’m in no way saying you don’t get premium stuff for the money, and I’m considering re-mortgaging and getting two of the £250 deals as a starter, but enticing other players into a game is proving tricky at this point! Question from Craig: Good morning, and well done. A fantastic range of models, but I had trouble with PayPal so couldn’t place an order. Have these issues been resolved? Hawk Wargames Craig: We should be switching to an integrated checkout in the next couple of days, so if you’ve been having trouble it should be resolved soon! Question from Matt: Congrats on producing a really excellent range of minis. My question is simply, are you surprised at the level of interest this game as generated coming from relative obscurity? Hawk Wargames Anthony: For shooting, it’s roll to hit (weapon accuracy occasionally +/- modifiers), then roll to damage (energy vs armour, again sometimes with modifiers). Some vehicles have passive countermeasures, so get a saving throw. Question from Chris: this is probably jumping waaay ahead given that the game has only just gone to pre-orders but do you see the game expanding beyond the initial four races? Hawk Wargames Chris: We have a 5th race and new units planned already, but that won’t be for a while (as you say – getting ahead of ourselves a bit here, got enough on our plates for the moment!) We’d like to expand the game for years to come, so there will certainly be much more to sink your teeth into! Question from Chad: on the Battlefield: will we have any strategic options? On Scenery: will you be producing broken buildings or do we get to break them ourselves? at lower price points since buildings are important in the game and you shouldn’t have to shell out loads for them if you don’t want to! Question from Andrew: Morning. Are the models that have been shown of the site all that’s in the book in terms of the factions choices? While its a pretty comprehensive selection, wondering if there are a few surprises in store. Question from Jon: I know that on the website it says to have a balanced army however I am wondering what the requirements for an army will be. Obviously i will need some sort of HQ, a few infantry as compulsory units but is there a set list for what an army need in order to be used? Hawk Wargames Jon: You don’t actually HAVE to have an HQ (they’re not in the starter army after all!) They are good units though, so there’s excellent reasons to field one! Army lists have a fair amount of flexibility, but you can’t field massive hordes of unsupported infantry or whole armies of fighters for example. Question from Matt: Are the options to upgrade individual vehicles or battle groups and if so, how extensive are these? Hawk Wargames Matt: some armies have more upgrade options than others, but generally you can’t upgrade units much for now, as it’s difficult to keep track of what unit has what. This will be something for the future, where we have upgrade parts that can physically represent upgrades on the model. Hawk Wargames Stefan: At bit of conversion work shouldn’t cause arguments, proving you don’t do anything really crazy, like make it twice as big as before! Question from Marcus: Q2. With the Shaltari Eden Medium Gate does it drop 3 tanks or 1 walker? The Gaia is discribed as dropping 3 walkers or 9 tanks. The reason I ask is that I want some walkers, but I dont know if the starter force + a walker will work, or if I need to buy a Gaia to get access to the walkers. Question from John: First I would like to say my bank acount hates you. 😉 I am pre-ordering 2 premium Mega Deals! My biggest question is: are models like vehicles used as individuals on the table, or do they operate in squadrons? With the purchase of large armies, I wonder if I will need to use each model one at a time? That could take a while!! Hawk Wargames John: Glad to hear it, and thanks :-)! Tanks etc operate in squads, and move together. They CAN independently target though, and be independently targeted. This works well in practice, and heightens realism. Also, it makes the ‘squad of 9 tanks vs 3 squads of 3 tanks’ end up as a fair fight (as it should do! ), rather than you having to pour all nine into one enemy squad of 3! Question from Imperial Outpost: Do you have any American distributors lined up already? I’m eager to bring this game into my store. 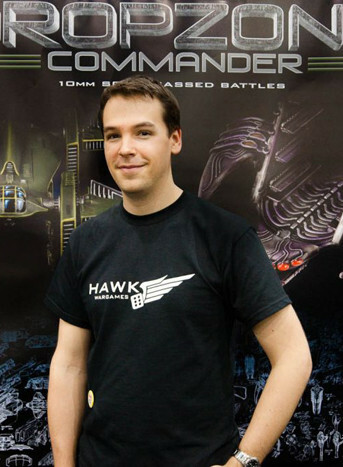 Question from Patrick: Is there gonna be an official Dropzone Commander Forum integrated into the Hawk Wargames Homepage? Hawk Wargames Patrick: We’ll be sorting out a forum in the near future. For the moment I’m concentrating on finishing things up, and couldn’t give a forum as much time as it would deserve. As soon as the game is out though, one will appear! Question from Marcus: I was also wondering about mechanics for the dice rolling. Will you be using 2d6 to get a bell curve? or is it 1d6 with modifiers, and then extra dice if it is a more powerful attack? is it just additive and subtractive modifiers, or are there multipliers/dividers? and do you use firing columns (if the enemy is in cover you move to another column on a chart to determine what you need to hit)? Question from Lex: Just preordered the rules (something I almost never do), and I’m wondering what the stats will look like. Could we get a range on move, damage, hit points and the like? Say, lowest move is 5cm, highest is 25, something like that. Thanks! Hawk Wargames Lex: Hard to be specific, but for a ground unit, the very fastest skimmer can manage 12″ moves, and the slowest tank plods along at 3″. I’d say about 4-6″ is typical for most ground units. Dropships considerably faster obviously (12-36″ typically). As for shooting (and against units with countermeasures – like tanks), directed energy (eg lasers) get infinite range, high velocity weapons (eg railguns) around 24″, low velocity weapons (like rockets) about 9″ – can vary a bit though, but always in multiples of 3 to keep remembering things easy! Question from John: Have you thought about adding deployable cover (like barricades dropped from low orbit or from a dropship)? Question from Zbigniew: Are you planning to release rulebook as ebook/pdf version? Hawk Wargames Zbigniew: May do in future, and indeed may do easy reference apps as well (early stages for the moment). One thing at a time though, but we are thinking about it! 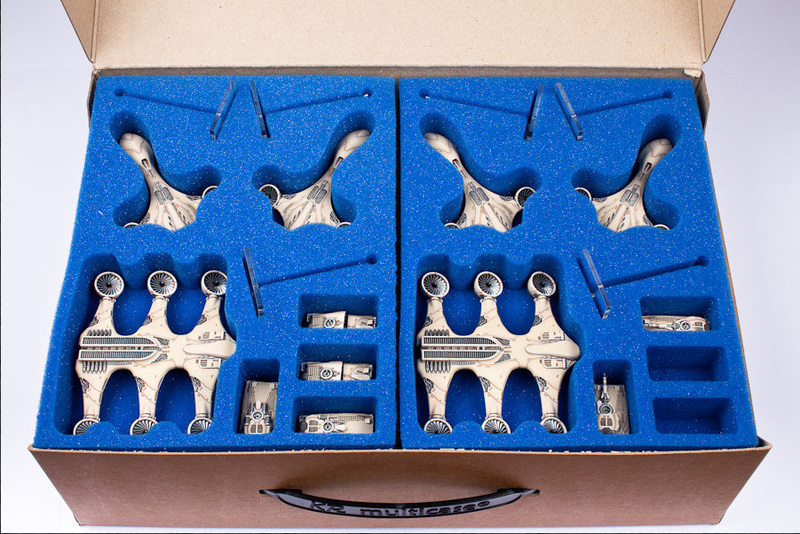 Question from Denis: How many different building kits do you have? The pics seem to show around 4-5 different sets. Can you give any more info on command cards? Do you have any sketches of Shaltari or Scourge (the race)? How tough are units? Can I expect them to take a hit or two before I remove them? How is measurement done without bases? Hawk Wargames Denis: The building are modular and tile based, so there are literally thousands of combinations! Certain styles do match well, so looking at it that way we have something like 10 set styles in around 50 distinct tiles, but don’t quote me on this, no time now to work it out right now! Will be fully detailing the range closer to its release. The command cards add small but often influential tactical actions to games. On the simplest level it might improve a unit’s accuracy for a turn, but sometimes it’ll be much more complex, such as intel discovering and underground tunnel between two buildings. You can hold/ play certain number per turn – the higher ranking your commander, the more cards you can play! If your commander is killed, you discard down to next in chain of command. Some units are fragile (eg scouts) and some can absorb multiple hits (eg heavy tanks). Obviously armour is also a big factor in survivability. 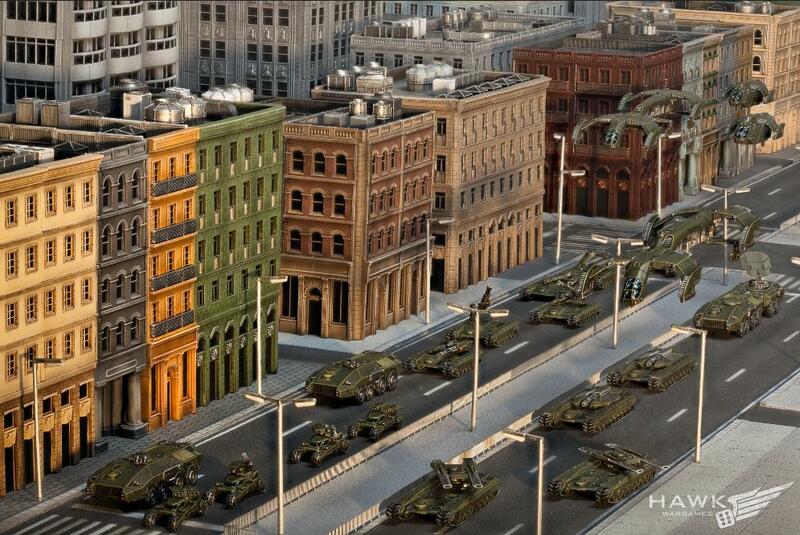 The game is designed to play out in a gaming night though, so don;t expect your tanks to absorb massive punishment! Think of them as 28mm soldiers in terms of toughness. Obviously, bigger stuff will last longer! Seriously though, this has got to have a 3D element to it, after all it’s forces dropping into combat. I don’t really want to get into arguments over how high my dropship is because it only comes with one flight stand. Hawk Wargames Craig: True LOS, except for aircraft. As you point out, altitude vs flight stands could be a sticking point! As such, LOS is normally measured from a point 6″ above the centre of the flying base. Also avoids overly tall and unstable flight stands! Hawk Wargames Dane: We’ll be attending as many shows as we can once the madness dies down a bit! Question from Rich: Hi Dave, apologies if this has been covered before, I have scanned your answers so far so I dont think its cropped up yet. Does DzC work well with any particular format of table size? For instance 3×3/4×4/6×4/5×5 etc etc . . . it’d be good to get an understanding of how big the battlefield will be, in general terms, I understand obviously that its ultimately upto the gamers. Cheers. Question from Neil: Hi Dave congrats on the launch! Loving the site and have said as much on the blog, Could I get a copy of the word file to post on the blog? Also May I ask what support you plan in the future for the blogging community? 6inchmove. Question from Konstantinos: Please provide the audience with a relevance in point costs. The “standard” or “tournament” game size is as I think I have read somewhere around the medium and mega deals. What is the average point value of each army’s “middle” models, and about how many points would you say are needed for a tournament sized army, and how many points would you say are provided with the three pack levels approximately? Hawk Wargames Konstantinos: We’re still in the final stages of finalising points costs, but army wise it’ll be similar to 40k in base (eg 1000-2000 pts per normal game). Can’t say exactly what the army sets are right now, but will very soon! As I’ve said, the Large army will be more than adequate for tournament play (think about 1500pts for a comparison), the Mega army for grander tournaments/ giving you more flexibility in choices. Depends on what sort of tournaments clubs want to organise tbh, as the starter sets are playable armies themselves! Question from Truax: Nice work – we all admire what you’ve accomplished here! How much “fluff” does the rulebook contain? How brutal are the AAA units? Is it a matter of having to avoid the “no fly” zones completely until you neutralize them, or is just risky? Can units “walk on” if needed, and can air units be held “off table”? Does the “low observablilty” of the UCM tanks have a rules effect, or is it just advantageous if you happen to have a lot of the right terrain? Very cool to see a “hard science fiction” idea like that in action. Hawk Wargames Truax: The rulebook contains lots of fluff! More than double the amount that’s on the site! AA units are pretty brutal against aircraft (they’re supposed to be after all!). Skilful placement of these will protect your units from strafing/ having units dumped right on their doorstep. Obviously, you can use your tanks to neutralise air defence :-). All this gives much cause for fire and manoeuvre, even for ground units. UCM tanks low observability does indeed have rules! They can fire from behind low cover, but after doing so they can suffer return fire (but count as hull down). Question from Mark: Can you give us more info about how the battlegroups work exactly? ie: I understand that all models in a group will activate together, however is there a ‘group coherency’ or some such? Do they all have to target the same enemy models? Is morale/retreating involved and if so how does that work in regards to a group? Hawk Wargames Mark: Squads within battlegroups activate simultaneously, then each squad within the battlegroups completes its Actions (moving, shooting etc) in turn. Squads within battlegroups do NOT have to stay in coherency with each other though, and can thus go their separate ways. Question from Gary: How variable are weapon options within a unit/squadron, for example would be be able to field 2 buggies with rockets and 2 with chainguns? How important from a gaming perspective is the size of the flying bases? Could we model our own or do they need to be 40mm square for rules purposes? How are you this awesome? How varied are our options for which dropship can be used for which units, for example, could a small UCM dropship carry a single APC? Does the flight stand fit into a loaded UCM heavy/medium dropship when loaded with 9/3 Sabres? Hawk Wargames Gary: A few squads (such as the wolverines as you point out) may have multiple weapons options, which you’re normally free to dish out as you please. The physical size of the flying base is pretty much irrelevant in game terms, since the centre is used for measuring distances, so feel free to model your own if you prefer! Lol! Well I manage all this through a combination of luck in having the right skills, practice, dedication and being happy to give up a lot of sleep and pretty much all my free time to the cause! Dropships have to be filled at the start of the game (it’s inefficient militarily after all!) This stops people taking heavy dropships with just one tank in it lol. Question from Mark: One more for now: After a dropship has deployed its cargo, does it stay on the field for the rest of the game or can it leave the board? Basically I’m wondering if a single dropship can carry multiple battegroups to the field during the course of a game? If they ‘stay on’, can they pick up and relocate their battlegroups? Question from Steven: Hi Dave, I’d like to know a little about the resin that’s being used. How much clean up will it need (e.g. washing) and what is it like to work with in terms of flexibility etc.? The resin does NOT require washing of any kind! Having said that, I strongly recommend a good coat of real primer (I’ve been using Tamiya Fine White surface primer). Future coats stay well and truly glued to the resin after that! No paint flaking here! Parts need very little cleanup. A tiny amount of flashing in some cases, and normally a small runner, which will easily clip off. The resin is not brittle, so no worries about chipping off bits you didn’t intend to! There’s been a bit said online about this by painters working on the guest painters pages already. Question from Kevin: Will you be using distributors in the UK or just selling direct? Re. Dropships..once they’ve dropped off..do they have any other function..ie firing,bombing..picking up other units to re-equip.I ask because they are the biggest and most expensive models so hoping their function is more than transport? Hawk Wargames Kevin: We’ll be working with Kingsley distribution for the UK (to be announced officially soon). We’ll also be happy to deal with stores direct. since they’d just dominate games! However, the need to flexibly and quickly more your troops around during games means that their job isn’t over once they’ve deposited their cargos. Think of them as Rhinos that are useful for the whole game, rather than Land Raiders. Question from Harold: hey Dave congrats and good luck on the launch i hope it goes well for u! the idea behind the game looks prommesing. i was wondering structures an scenery are important to this game in my mind as obstructions and cover. Hawk Wargames Harold: Structures are very important to the game, and there is an extensive ruleset for them! They can indeed be destroyed also. Some units (such as the UCM Seraphim with its bunker busters and the PHR Enyo Seige Walker) are designed specifically for this purpose! Question from Alistair: How do you work out what size a battlegroup should be. Is it what ever is attached to a dropship? Or can you have more than one dropship in a group? And how does it balance? EG If a battlegroup of 6 tanks fights 2 battlegroups of 3. I’m guessing the guy with 6 tanks doesnt get to fire twice as much each turn? Hawk Wargames Nathan: Sorting out Aussie distribution this week, they’ll be something sorted out for you for certain! Question from Xavier: Will there be an intro set? ie 2 factions (obviousely less models than the smallest set), rulebook and both sets of cards? Hawk Wargames Xavier: Will be looking into it, but difficult to get the full feel of the game across in a small set, which is something I’d like to do ideally. Question from Ian: Do you need infantry for a legal force? If not, then can we have an army just compromising on Walkers and Artillery? Question from Truax: Will we be able to get the turret options separately? We’ve heard a typical scenario is like Black Hawk down which is excellent- can you give us an idea of the other standard scenarios and their themes? What do you see as the pros and cons of being attacker and defender in a scenario, or are they all symmetrical? When infantry are in a building, can they be targeted or do you destroy the building? How good are infantry against tanks at point blank range? Hawk Wargames Truax: Other scenarios will involve demolishing certain structures, attacking an entrenched defender, searching a crash site.. there will be plenty! Games where there are attackers and defenders will obviously necessitate certain force structures, sometimes the scenario will give a defender some ground troops already in place, with reinforcements arriving by dropship for example. When infantry are in a building they can be fired upon directly from the outside IF they’ve elected to fire from the windows, otherwise you’ll need to either flush them out with your own infantry, use flame weapons or demolish the building! Also, falling masonry damage will kill occupying infantry, so they can be harmed before the building actually comes down! Question from James: Can you give a realy loose turn overview? Eg, unit activation, move, fire, tidy up? Also can you activate a single battle group more then once per “turn” (assuming there are side turns)? How well does the game suit multiple players or is it just “Cram into two sides”? For the modellers, it appears the folding turrets fit flat, I have a terrible urge to hinge everything and magnetise the vehicles to fit the drop ships, possible or mad? Hawk Wargames James: REALLY rough turn overview: 1) Initiation – roll for initiative, play certain, roll for reserves etc, 2) Actions – players take it in turns to activate one battlegroup at a time, completing the actions for each squad within in (move, shoot etc, although you can shoot then move also) 3) Roundup – act on any ‘end of turn’ abilities, check victory conditions. Question from Graham: What effect does being in a squadron have? Hawk Wargames Graham: Being in a squad gives more units per slot in force organisation mainly. Also, since they activate together they can make an impact in one go. Generally, squads are there to keep activations and organisation manageable. Also, squads need to be of a certain size to fit into dropships, which must start the game filled. Question from Jacob: Q1 does the game have rules for difficult terrain and does each vehicle type (wheel, tread, anti grav, and walker) have their own charts for what is considered difficult or is there a blanket statement that covers all types. Hawk Wargames Jacob: Yes, there are various rules for terrain types, and the unit’s mode of movement (eg normal, walker skimmer) does have a effect! Hawk Wargames Graham – 1 large dropship is cheaper in points than 3 medium and cheaper in real terms! Also, they sometimes carry heavier weapons (eg the Scourge Despoiler). The medium’s are more flexible, can carry smaller squads and are generally faster. Question from Gary: Do you see the game as functioning well in a super competative tournament enviroment, or more as a scenario story based casual wargame? Hawk Wargames Gary: Time will tell in the tournament department. Obviously, ANY new ruleset will be at least partially picked apart by the tournament scene, and while we’re being as diligent as we can I’m sure there will be things we missed/ didn’t foresee. (it would be unrealistic and arrogant to suggest otherwise!). Releasing tournament play updates online and supporting balancing adjustments in the short term that way is something we will be doing if necessary. Question from Rich: Is there some form of linked fire/co-ordinated fire system for squadroned vehicles/units? Hawk Wargames Rich: there are certain advantages (such as being able to fire through one of your own vehicles, providing that it’s part of the same squad). Also, simply getting more shots gives a larger squad more impact. Having said that, in smaller games smaller squads are more sensible, it’s just that you’ll need to field larger squads in big games, since your organisation slots are limited. This is all done to limit the number of activations and make larger games flow just as well as smaller ones. Question from Angus: Hi Dave, sorry if this question has already been asked, but will there be painting guides available on the website in the future? The display models are absolutely stunning, and I’d love to find out a few tips on how you get them looking so sweet! Hawk Wargames Angus: There will be a painting and hobby guide in the rulebook, as well as free online guides. It isn’t as hard as you might think to achieve this level of painting for presentation models, although some are harder than others . I won’t be keeping my secrets close to my chest though! Question from Adriano: What are the plans for future new armies? Hawk Wargames Adriano: Can’t comment specifically right now (we’ve got enough to deal with atm! ), but there will be new armies, as well as new units for existing ones. We plan to ALWAYS support all armies equally. Hawk Wargames Stefan: Will do something like this if there’s time! However, if you don’t buy too much of one thing you won’t go far wrong! The organisation puts an emphasis of flexibility if you see what I mean. You’ll always need some infantry, some AA capability, some anti-armour weapons (tanks usually, but the rules are true to the backgrounds on the site!) and normally dropships for your ground units. Question from Andrew: In a non-rules related question, how did you go about building your game. Did you start with a set of rules, then write up your background, the other way round or did they grow together? Hawk Wargames Andrew: They grew together. The whole thing started with the dropship concept, and the entire game (rules, models, everything!) was designed to fit this concept. This ensured a cohesive project with some clear aims in mind :-). The specific unit rules and their backgrounds we devised together, rule of cool playing a fairly big part! Even through the rules were in their infancy during the design stage, I had a good idea of how I wanted each race/ unit to play from the start – this being an advantage of one maniac working on the entire project! Hawk Wargames Jacob: Countermeasures come in two flavours, Active and Passive. Active detects an incoming projectile, and destroys or deflects it before it hits the target, given enough time (think localised shields, decoys, defensive lasers, defection beams etc). Passive is an all-encompassing energy shield, and always has an effect (much more advanced tech). Passive countermeasures usually grant a saving throw, and almost always have an effect, regardless of how fast the projectile is. Units with Passive Countermeasures usually have Active ones also. Question from David: If the rule book needs a large update and we have purchased the first (vanilla) copy how will you present the updated rules/information. I understand you will playtest the heck out of it, but stuff will always surface. Hawk Wargames David R: If the rules need an update, this will be issued for free as a pdf – you shouldn’t hav to pay for any mistakes we make! Obviously there will be a 2nd edition sometime down the line, but this would include more than just alterations. Question from Antonius: First: Hello, great looking models and a real nice Background. Now the question: is the Game mechanic an i go u go system or do players have a chance to react on moves of the opponent ala Infinity or Tomorrow’s War? Question from Neil: I imagine that there is a possibility of stuff embarked in an APC or dropship that if the dropship gets destroyed that you can lose the embarked stuff too….. I wonder if gates protect you from that as the units are in “limbo”. Also can units move through one gate to another instantly? This will give the Shaltari an excellent advantage. Hawk Wargames Neil: Embarked units can get wiped out if the transport is destroyed, but there’s also a fair chance they might survive unharmed or take damage (rolled on a results table). With an aerial transport that would be ‘Destroyed in the Air’ (everything inside dies), ‘Crash Landing’ (everything inside might get damaged) or ‘Emergency Landing’ (everything gets out alive). Question from Devon: I’m very curious about the game mechanics / dice mechanics of the rules. If you can what game is most similar to what Dropzone Commander is? Are the mechanics similar to Spartan Games, 40K, Heavy Gear…etc… As a retailer I have a crowd really looking hard at this game. But it’s going to come down to the rules in the end. Hawk Wargames Devon P: Hard to say exactly what it’s most similar to, but the combat/ shooting mechanics should be reasonably familiar to most players (not massively re-inventing the wheel here!). The command card mechanic is vaguely similar to that in Uncharted Seas (certainly in its aim of adding extra flavour to the races anyway, although they work quite differently). Players I’ve play tested with have been pleased with how easy the game is to pick up, and I’ve found it quite easy to teach people to play after a bit of practice. Question from David: Q1 – Would you be willing to tell us how much health/damage boxes/etc the Scourge Desolater will have, or other stuff like the UCM Gladius HBT? Q1.5 – Will you be able to destroy weapon systems or eliminate mobility on those larger models, or will there just be Hit Points/damage boxes and/or an effect like “shaken/stunned”? Hawk Wargames David G: Most ‘standard’ units (medium tanks) have one damage point (except for the PHR), heavies generally have two and larger models 3 or more (the desolator has 4). Infantry have 3 or more per base (normally 5 for a 5 man base). As such, high rate of fire anti-infantry weapons work best against them (an anti-tank round will REALLY spoil one or two guy’s days, but a minigun will be more effective). You won’t be able to destroy individual weapons (at this level anyway), since it becomes unnecessarily fiddly to manage larger games, and avoids piles of tokens + excessive record keeping. Question from Neil: Question about dropships and gateships. The Warstrider is quite large compared to some of the other miniature will this unit be restricted to the larger Gateship The Gaia and with other nations have similar restrictions? Hawk Wargames Neil: The warstriders are essentially twice as big as a heavy tank, so the Eden (medium) can move one at a time, and the Gaia (heavy) can move up to three. Other races may get larger units in future…. getting ahead of myself here though! Pre-orders will be dispatched on the 23rd, so should be with you shortly after that, depending on which country you’re ordering from obviously. Question from Christopher: You’ve already mentioned that a potential 5th faction may be in the pipeline, I can only assume that you may have plans to further expand the 4 factions you already have. Would you be doing this in a similar manner to how privateer press released Warmachine in expansion waves, with a bit of love for everyone or would you rather focus on a faction at a time. Also, do you ever slow down? Hawk Wargames Christopher: Sort of answered this earlier, but yes, all factions will always be supported equally! There will always be a bit of love for everyone. Most likely, new races will be released alongside expansions, which will include new storylines, plot developments, new rules + scenarios and new units for all existing races. I can’t stand it when games companies don’t support those who have already invested! As to whether I slow down… not lately! I didn’t get much sleep last week and can’t see free time prospects improving much for a while – good job I love doing this! Question from Gareth: I am sure you have answered various iterations of this question. But I couldn’t find a clear answer. I am interested in picking up an army deal, but I am not sure (obviously I know we will have a better idea when you release the things you are planning) how much flexibility in unit choices and expansion there is in each army deal. Can I play a smaller game then the starter or is that the smallest level? Is there room for flexibility in force composition in the Large deal or is that a fully complete force that is played as a whole? Any information on the force makeups and composition flexibility of the army deals would be fantastic. I hope I am articulating what I am trying to get at. I am interested in Shaltari primarily and PHR secondarily if that will help clarify your answer. Also, I found your answer regarding point costs (1500ish for a large) to be the closest to the information I am looking for. Hawk Wargames Gareth: Cheers! You could play a smaller game than the starter, but the reason they are what they are is that it’s the minimum size to get a feel of most of the game’s core mechanics and to experience it as it was intended (with the dropships, interplay of elements etc). balanced with their equivalents from other races (balanced by model content). Often you might want to reconfigure your army a bit to deal with different scenarios, especially for casual play – in this case the Large and Mega deals give you a flexible and well balanced pool of units to choose from. Question from Endre: How does the Shaltari Gate system work in comparison to the dropship landings of other species? Hawk Wargames Endre: A bit complex for a facebook post, but in general terms: Gates move and deploy troops just like normal dropships, although they aren’t physically carrying them. Multiple Gates can also be activated to transfer units from one gate to another, but each gate may only perform one embark and/or deploy operation per turn. Aside from the speed, a big advantage is that your units are safe until deployed. A disadvantage is that should the Gate be destroyed, there’s no chance of troops getting out onto the battlefield after a crash landing – you’ll need to send a new Gate to the target area. Question from Jason: I’m a big fan of the buildings. Where did you draw your inspiration for design? It reminds me of of more Sci Fi Beaux-Arts than the Sci Fi Gothic we’ve gotten used to seeing. Question from Cole: Which army, in your opinion, will be the most difficult to learn how to play well? Question from Pierre: Will there be an unlimited availability of the army deals, or do these cease to exist after the launch? So will I be able to order e.g. a Shaltari mega deal after 23rd July? Your game is gorgeous, keep up the good work, good luck! Question from Joshua: You mentioned that AA capability is going to basically be a requirement in army compositions. Can fighters effectively replace ground units in this role? Hawk Wargames Joshua: They could do, but you can’t always rely on your fighters to turn up every time you need them, so it’s a risk. Also, they can’t operate well in confined, high rise environments. Fighters are equally vulnerable to enemy air defence, so might not be able to make a pass without exposing themselves to enemy fire. Question from James: Not a question as such, but how have you managed such a quality jump over the big playesr? We have all seen a certain major manufacture completly “fail” with supposed high quality resin casting, how are you able to mantain such fine detail? I suppose I fear degredation over time…. Hawk Wargames James: To start with we’ve invested a lot for a small company, secondly we’re using some new and high tech processes and materials that are newly available. Also, this type of quality only comes with effort (me spending 3 months cleaning 3000+ masters for example!) Lastly, in response to the well publicised ‘failure’ of another range, I think their problem stemmed from the vast quantities they needed all at once, and the massive size of the range. I’m not going to start company bashing here though, everyone’s situation is very different and I can’t comment fairly on theirs. Question from Adam: Obvious question here, I’m assuming if you have infantry in a dropship they can land on the roof and deploy right into the building? Hawk Wargames Adam: you can indeed land on roofs if they’re large and unobstructed, and can enter from the roof if there’s an entrance. UCM Praetorians can fast rope straight in, and make an entrance with breaching charges if there isn’t one to hand! Question from Matt: Two questions: 1) How does the Taranis work if rockets have a very short effective range vs countermeasures and 2) What makes the Athena capable of operating by itself and in a multirole function over the fliers of say, the UMC? Question from Anders: Will anti infantry weapons like the PHR miniguns have any use against light/medium armor? Hawk Wargames Anders: Anti-Infantry weapons are virtually useless against heavy armour (AK’s having no chance against an M1 in a real life example lol). however, heavy calibre anti-infantry (like UCM vehicle mounted machineguns) will just be able to damage the lightest of combat vehicles. Question from Craig: Sorry if you’ve already answered this, But will the larger army deals be offered through distributor’s, or anywhere other than your website? Question from David: Will force organization vary by mission, or can you always show up at your Local Game Store with “1,500 points” built from a universal force-org, so that you can find pick-up games easier? Hawk Wargames David: There will be a ‘standard’ chart to use with most games. These scenarios will for the backbone for tournaments I imagine. Other, specialist scenarios will allow different compositions and might be best suited for casual/ pre-organised play. How this will all work with tournaments is something I intend to help organise once the game is out. Question from Neil: Will you be doing any army deals with the rule book included like the Mega for example? Is the rule book printed? When will you print if not? Hawk Wargames Neil: We’ve set our deals for now, and changing them after taking pre-orders would be messy. Also, they’re designed for the best value for the models themselves, especially for those building massive armies and buying more than one army. That way the price isn’t increased a bit by adding a rulebook to every army deal, whether you want one or not, if you see what I mean. I think the rulebook is good value in any case, given the amount of content and its size. The rulebook will be going to print very soon (we have a fast print deal setup with our printers). We’re essentially assembling and formatting it now, all the elements are finished except for the guest painters page and parts of the hobby section. Question from Gareth: Fluff question: What are the Shaltari’s motivations for fighting? Have they ever been attacked by the Scourge? Hawk Wargames Gareth: The Shaltari are quite self serving, and thus fight for their own, often incomprehensible reasons. each tribe has very different motivations, and they often fight each other! They’re quite warlike, and believe in trials of strength. Also, they hate the Scourge just as much as everyone else! Scourge attacks on the Shaltari are unknown to humans (from whose perspective the background has been written from), but no doubt it’s happened at some stage! Question from Adam: Two questions, first. Will there be the option for off table artillery such as cruise missiles that don’t need a command APC? Hawk Wargames Adam: Such things do come into play with the command cards, and might see more comprehensive rules in future. You can always hold/play one command card per turn, even without a commander. Question from Jonathon:About how large are the army starter deals in terms of a typically sized game? I work at my LGS, and there are a number of people that really want to get into the game, but feel that 130 dollars for the starter and rulebook is kind of steep. They’d probably be more willing to buy in if they knew that the base starter was, say, a third or so of what they’d need for a normal, playable army list. Question from Inyoung: Is there any possibility of some free PDF basic quick start rules to grasp the game mechanics? There a are a lot of us that are hesitant in investing until we see how the actual game plays. Thanks! Hawk Wargames Inyoung: I quite understand. We’re not ruling something like this out, and we’re also considering doing a battle report or two very soon (see earlier answers). Question from Dimitri: I like your explanation of range, I understand energy weapons will have unlimited range, but what would be the common range for other weapon system on the table, like an anti-infantry minigun, or one of those nasty-looking railguns ? Bonus question : The loaded dropships look very nice, will we get see to pictures of the Albatross with loaded vehicles? Hawk Wargames Dimitri: Some common ranges (against countermeasures) – directed energy- infinite, railgun 24″, cannons 12-18″, missiles 6-12″, anti-infantry (generally) about 12″, although infantry don’t usually carry countermeasures, so the full range (normally 36-48″) can be used against them – try not to leave your infantry exposed: they won’t last long! The reason there isn’t a painted full albatross is that I’d need to paint an extra 9 folded tanks, and simply ran out of time! Expect to see one in future though (at the very least unpainted), the tanks do fit properly! Question from Iain: For the very basic starter armies, could you give me a breakdown of the battlegroups used? Question from Joshua: Also: Are command vehicles required to have commanders or can you assign command of your army to any model? Do the individual battle groups have commanders, as well? Also: Are there mechanics in place for performing hotdrops? ie: A dropship at altitude, moving at full speed dropping its cargo into an area covered by enemy AA. Question from Corky: About the UCMA folding tanks…do the turrets actually fold and pivot on a pin or will you be able to customize that? Hawk Wargames Corky: The turrets can be glued in all sorts of positions, since they do feature proper positional joints. It would be possible to pin them with some skill, would be tricky though since they’re so small! Question from Neil: Magnets will make such a different being able to connect my PHR to the dropships for deployment and taking them off for combat. I cannot wait! Hawk Wargames Neil: PHR are a good choice if you like magnets – they’ll be fairly straightforward to do in most cases, except for the occasional flying base mount conversion (in some cases there isn’t quite enough room for the transported units and the flying base). Thinning it at the top or using a long pin is an easy fix :-), especially since the models are lightweight. Question from Adam: Ok, another question now. Direct Energy weapons, will they be able to punch through multiple targets if lined up right? Or just freem the first one? Hawk Wargames Adam: Directed energy generally cooks at one thing at a time (very precise weapons usually!) In the case of the Shaltari Ocelot’s Particle Cannon, something gets REALLY crispy! Question from Jason: I think most of us understand you’re operating as a very small company right now, how much thought have you given to how much bigger you would like to grow? Is demand/interest what you had anticipated? Hawk Wargames Corky: We’re still finalising the exact size, but hopefully we’ll get it the same as MTG cards, then they’ll be compatible with standard sleeves. Failing that, they’ll be the same size as regular playing cards. Question from Andrew:You mentioned while answering one of my previous questions that there would be different campaigns etc. Does this mean that you’ve set the core rulebook against the campaign for a certain sector of space, and future expansions may be in various other sectors? Question from Callum: Hi Dave. If you were to sell me DzC on one defining game mechanic (not what things do but how they do it) what would it be and why? Some examples would be Wm/H focus/fury or Malifaux and fate decks. Hawk Wargames Callum: Hmm, hard to say that… In many instances We’ve used/ modified tried and tested mechanics to achieve a fresh outcome (ie the dropship focus) and in others we’ve used new ones. the countermeasure mechanic I think is a new way of maintaining realism in sci-fi while still giving plenty of cause for fire and manoeuvre, and I’m particularly happy with the way infantry, vehicles and aircraft all share the same stat line system while being very different in play. Question from Neil: Dave, do you plan to go on the road to shows? I mean mostly the UK as the high costs of going abroad. If you do go will you just sjow your line, sell your line or do you plan of having another company sell it for you? Hawk Wargames Neil: I’m planning on attending as many shows as possible, once the initial madness dies down! There’s just too much going on now, but I’m very keen to physically go places and see people – no substitute I think! Question from Adam: Another modelling question now, how durable are the models actually? And are they proper resin or that half plastic stuff that Warmahordes make their starter sets out of? Hawk Wargames Adam: The models are VERY durable. To show people, I’ve been throwing Shaltari dropships against walls! (not that I’d recommend anyone try this obviously!) So far I’ve never had one break, and the resin accepts super glue really well… a little too well sometimes! Once they’re glued, they don’t come apart easily! Question from Grant: What are you willing to do if balance issues are found in the game? Are you willing to change stat numbers through free PDF’s, or are you only willing to reword rules? I ask this because I play Warmachine a lot (love the game), but a few simple number changes on units would be great. However PP refuses to change stats in fear of alienating players who don’t read the free updates. Thoughts? game that involves this much (and a brand new game at that!) I think in the modern world the best way of resolving issues IS to use free pdf updates. That way it costs you nothing, and everyone gets access to the changes. We’re obviously doing our best in playtesting though! Question from Chad : Are there plans for individual “Army books” for each faction or will the Expansion book contain all the updated stats, rules, ect for each factions newer releases? Hawk Wargames Chad: The expansion books will contain new units, updated rules, additional factions and will advance the storyline – sometime in the future though, we have enough to be getting on with atm! Hawk Wargames Isaiah: I’m planning on doing rules previews and perhaps a battle report or two in the near future, but my main focus has to be finalising the rulebook and getting it to print on time. I this will own me for the next few weeks, but I’ll do my best to get some fresh content to you! Just don’t expect a preview a day – you’ve got a site with 600+ images to browse! Question from Stefan: Hi Dave, for all of us that have blogs/websites etc, are you planning on putting together a download of logos/promo shots for us to use? Hawk Wargames Rich: Yep! The Mechit is a specialist anti-infantry unit, and since the PHR have a few more units than the other races (in the form of variants) it was impossible to squeeze them all in while still giving you equivalent anti-tank firepower. The Menchit is great at clearing buildings though (it’s got a flamethrower :-D!) so it’s quite a useful add-on in some situations. No worries about spending the time, I think it’s been worth it too! Wish I could give you all more time at this stage, but shortly I need to return to the last push needed to get this thing out there! Setting aside and dedicating a day to this seemed more comprehensive than trying to answer questions piecemeal! Question from Andrew: Oh and just a last question, are there any plans to do heroes in the game? I don’t mean the uber-warriors of 40K and their ilk, but just named commanders who have a trick or two up their sleeve. Well there you have it. Loads of new information on the rules and what we can expect when they hit the shelves. I was looking forward to the game but wary of what the rules would be like? Thanks to today’s Q&A with Dave I can say I am not worried about the rules anymore. I look foward to reviewing them for you! DropZone Commander – It’s Alive! Well it is finally here, the journey is at it’s end… Wait a minute, that’s wrong it’s just begun! 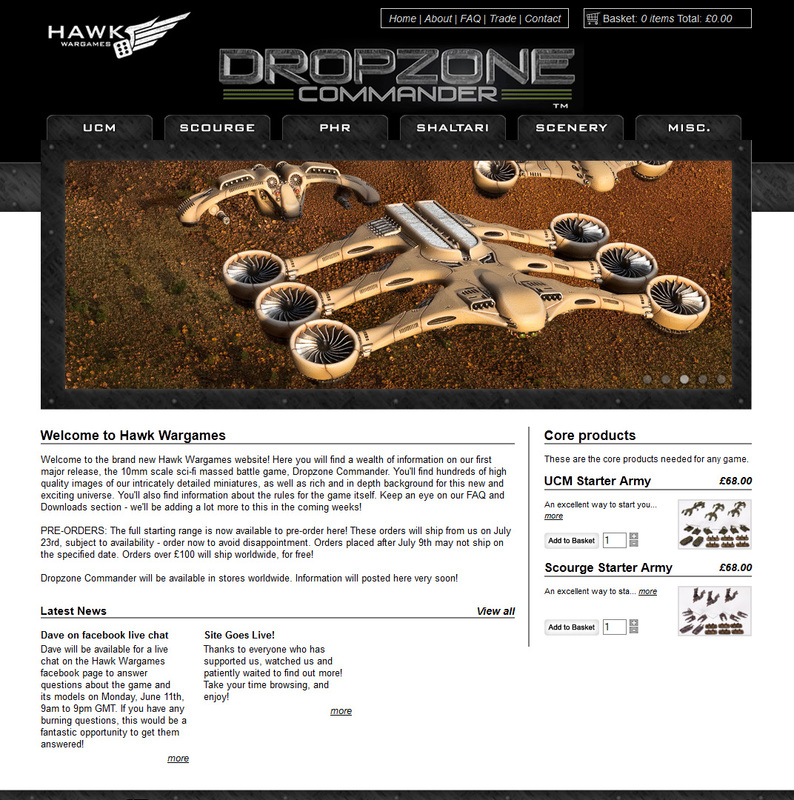 Hawk Wargames’ new website is now LIVE and you can see DropZone Commander in all its glory as the pre-orders are now available. Planet Earth and the original Cradle Worlds are lost to the great foe, the Scourge. The shattering invasion of this terrible enemy has torn the domains of man asunder. The remnants of human civilisation now exist in a collection of frontier planets. Thinly spread and underdeveloped, they are pale shadows of mankind’s former glories. However, this is not an age without hope. Humanity has found new strength, unity and purpose in these times of dire fortune. The colonies are undertaking a period of vigorous, dynamic expansion, unrivalled in the history of our race, united by a common purpose – Reconquest. So after a few teething problems with the launch date I stayed up enthused with a host of fellow wargamers on Facebook (sad I know) patiently waiting for the site to go live on the 8th, bashing my F5 key, it was close and went up about the 1am GMT on the 9th. I had a good look round the site with tired eyes, making mental notes on what I liked to buy from the PHR range (Mega Army deal it looks like) and then comparing them to the other forces to get an idea of what I might face and what ZombiePirate may buy. The rest of the 6inchmove team are all interested as well but I have been discussing DzC with ZombiePirate daily since Salute. I think the art direction of the site is excellent, clean, crisp and sharp filled with great photography and ease of navigation, it’s what I expected from Dave to be honest. Each faction is clearly marked for ease of access and each miniature can be accessed with its own information and most have multiple images from many angles as well as unpainted versions, which I like. Thumbs up for that. 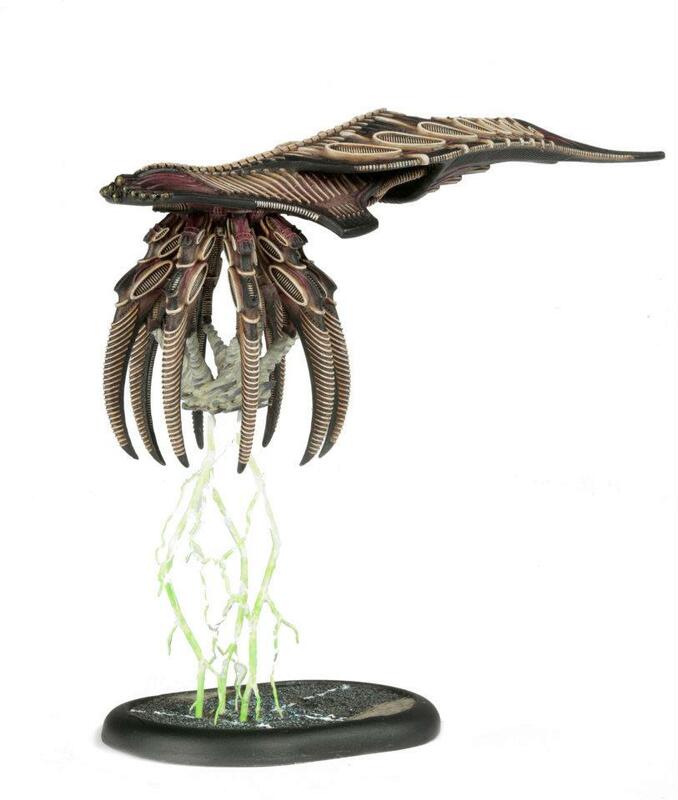 The army deals look to be the standard collection you would expect with a good mix of ground and dropship mix, the Shaltari seem to have a high number of gate ships in the larger army deal, I wonder if that is due to the rules? Lavish painted miniature throughout and excellent group shots. For an extra £30 over just the miniatures pictured above Dave at Hawk Wargames has teamed up to offer the army deal in a KR Multicase. So not only do you get an awesome army but you can have a case right from the start cut to fit your army into it! Awesome. Note, this is a web exclusive and may only be available on Hawk Wargame website as a package, I expect the individual items to be available seperatly. The terrain is not currently available at the moment which is a shame but we are treated to some nice rendered images. I dont see a forum as of yet? I think there are a few members of the 6inchmove team that plan to be quite active on the forum, it is somthing I have mentioned to Dave on the odd occasion, look forward to that happening. I think it’s a shame there is not one available now though, it would be good to get as many people as possible together talking about the game now while pre-orders are available and create a central community for Hawk wargames. While not a big fan of social media like Facebook and Twitter I can see the need and usefulness of them. My other half posted about watching a program and talking on the phone about something, this is why I avoid it. But to add information about new lines and products to a consumer is where they shine, but it’s even better if you can get them all on a forum dedicated to your own product line. I am really interested in how the rules will work as I am a firm believer that they can make or break a game. You can have the best looking miniatures in the world (DzC is one of the best IMHO) but the game can get shelved if it is just no fun to play, I am a little nervous about the rules as I really want to play this game and have years of enjoyment with it. So I will get the rules what ever my choice to invest in the game or not and bring you my thoughts on how they play and what the game feels like as soon as I can. I will not read them and say, wow these are good or bad, I believe I need to actually playtest them and give you an informed and honest report. The rules are listed at £15, which is not a bad price at all for 152 page A4 full colour perfect bound rulebook for Dropzone Commander. Contents include: Core Rules: All the rules you need to play. Background: Rich and detailed setting for the DzC game universe, as well as in depth background for all. These sound interesting, I look forward to the suprises I can spring on my enemies. How many models do I need to play? DzC can be played with a few models, right up to massive engagements with hundreds of tanks. However, the amount of models you get in the starter armies is a good benchmark for the smallest sized game which can involve most of the game mechanics. Multiple army lists can be used for truly vast games, and so there’s no limit to how many models can be fielded, although such a game would require some serious space and time! A typical game with a good sized army (anywhere between the Large and Mega army deals in size) lasts around 2-3 hours, with players who know the rules reasonably well. Obviously this depends a lot on scenarios etc, but most games should easily be playable in a typical games night. How easy is to learn the rules? We’ve has taught playtesters that we’ve never met before while playing the game, and by the end of a 3/4 hour match they’d pretty much picked up the rules. Feedback confirms that the rules are very accessible. How long are the rules? The rules are fairly extensive, and cover all aspects of the game. Since it’s a full sized battle game the rules do cover a lot of aspects. They are about 15,000 words long including explanations – this equates to around 30 A4 pages including plenty of graphics. What turn structure is used? Dropzone Commander is an alternate activation based game. This means that players take it in turn to activate ‘chunks’ of their armies, known as battlegroups. These usually contain a modest number of squads which are usually related. For example, a support battlegroup might include tank destroyers and artillery. Some are more flexible than others – it’s best to think of them as mini army lists. Armies usually contain around 5 battlegroups in medium-large games. It’s the size of the battlegroups, not the number of them that generally increases with game size. As such, it’s easy to keep track of things, and each turn doesn’t contain a bewildering number of activations. It’s a good idea to subtly indicate (with markings etc) which battlegroups units belong to. An opponent’s activation can sometimes be interrupted by certain actions (such as air defence reaction fire and aircraft intercepts). In any case, you rarely have to wait long before you get a chance to react to an opponent’s actions. Overwhelming force can seldom be brought to bear in one go. Games usually last around 6 turns, although this can vary considerably with scenarios etc. How is shooting and weapon ranges managed? Shooting is often a sticky subject in Scifi. Some games arbitrarily give high tech laser weapons absurdly short ranges, while others give them realistic ranges, often precluding the fun of fire and manoeuvre on open battlefields. In Dropzone Commander, weapon range is limited by the kind of countermeasures the target unit possesses. All weapons feature an ‘Range- Absolute’ and a ‘Range-Countered’ value. Practically all vehicles and aircraft utilise ‘Active Countermeasures’, and as such the more limited range will be used to fire against such targets. This range will be governed primarily by the weapon’s velocity – something like a railgun will have long range, whereas a missile will have a much shorter range (since the countermeasures have time to lock on to and destroy the incoming projectile in time). Directed energy weapons generally have an infinite range. I’d like to build an army but obviously I haven’t seen the rules or army lists. Is there a guide I could use? At this stage, your best bet would be to use the army deals as a guide to a well balanced army. Even if you don’t wish to buy this much all in one go, they should give you an indication of the sort of content an army will need. There’s a good amount of flexibility in the army lists though. Are certain unit choices limited? 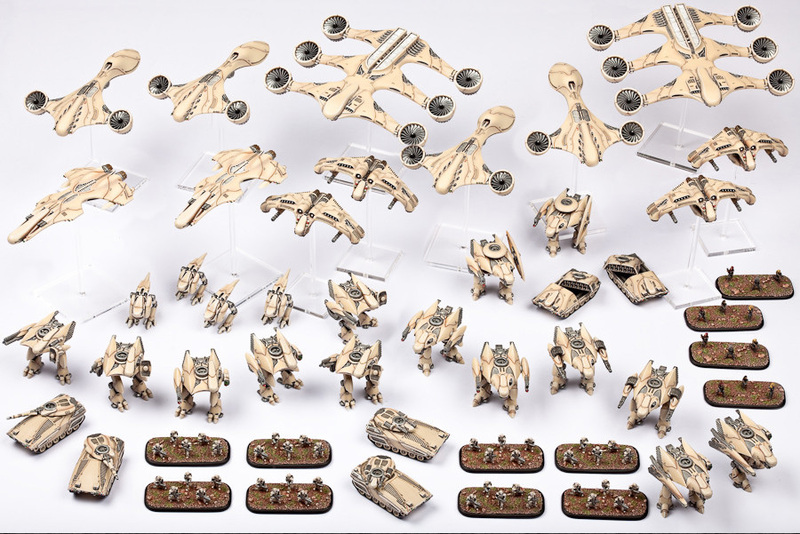 More devastating and specialist units are somewhat limited in availability – you certainly can’t have a whole army of strike fighters! Balanced armies are nearly always best in games anyway, since you will need a wide range of abilities to achieve a tactically flexible army. How do infantry operate, and do I need to paint up hundreds of little men? Be sure to always have some infantry squads in your army. Infantry are the only units which can enter buildings and secure objectives (although once captured they can often be passed to vehicles). Infantry are highly vulnerable and slow on the open battlefield though, so fielding hordes of them on foot would be unwise! The game is primarily vehicle based, so you won’t need to field too many of them. Do I need dropships for all my ground units? The rules don’t generally force you into taking dropships, although some scenarios do insist on 100% air mobility, since the game has been designed around dropships. Ground units are generally quite slow, and as speed and flexibility is more often than not key to victory, it’s advisable for most units to be given air-drop capability. Do dropships need to physically contain their cargos? The models have been designed so that every single ground unit can actually fit into appropriate dropships. This was done mainly for the benefit of keen hobyists and for increasing the sense of realism – everything in DzC is truescale! The rules certainly do not ask you to represent carried models physically, although it seems many will be using rare earth magnets for this purpose. While this will often work well, please bear in mind that they weren’t specifically designed for this, and it will be more difficult to make this work with some models. We will be providing carriage tokens in the near future which will fit onto the stems of dropship flying bases, representing what’s being carried efficiently and cheaply. These will be available to photocopy/ cut out from the back of the rulebook, and are high on our priority list to get made in card/ acrylic. Can all weapons shoot at aircraft? No. Only anti-air weapons can shoot at aircraft, unless they are landed – this includes dropships and gunships. As such, having sufficient air defence is vital. Do the four factions play differently? The UCM are all-rounder’s, with the ability to field a good number of troops. The UCM also has a lot of choice for air power, such as the awesome Seraphim. Their dropships are some of the cheapest in the game in terms of points cost, and as such they can normally get a few more ground units onto the table than other armies. The Scourge are fast, aggressive and devastating at close range. Shrewd players will benefit most from their abilities, since left exposed their units can absorb less punishment that those of the other races. they also have several unorthodox units (such as the Desolator), which gives them some interesting modes of attack. The PHR have the widest range of weapon options and upgrades, as well as some of the toughest units in the game. what they lack in numbers they make up for in quality. Almost every choice is better equipped than equivalents, although normally cost more points. The Shaltari operate very differently from the other races, since they use teleport gates to deploy and relocate on the battlefield. This gives the player a wealth of tactical options. their units are lightly armoured, although this is offset by their use of ‘Passive Countermeasures’ -all encompassing energy shields which effectively give them a saving throw from shots at any range or power. What extra gaming equipment do I need to play? Dropzone Commander requires only a small number of gaming aids, most of which you probably own already. Since DzC is D6 based, a good number (20 ish) of these would be useful. No other dice types are required (since D3 rolls can easily be simulated with D6’s). Various measuring devices are useful (all ranges in inches). Also, a direction determining device (such as a spinner) will occasionally be needed. Laser pointers may be useful for line of sight, but are not essential. Does the game work with more than two players? Yes, the game works fine for any number of players, although 2-4 are recommended. Any more than that and the game might drag by a bit, unless each player controls a battlegroup rather than an army – this isn’t officially in the rules but would be an easy way of introducing/ including more players. Does the game use/need tokens and templates? The game uses a small number of tokens. There’s also three blast templates (which are also used to determine whether aircraft have enough space to land). Most other tokens are optional and seldom needed, so if you don’t like sullying your majestic battlefield with abstract tokens, a modest amount of record keeping will see you through. Does the game use reference tables? The game uses only a few reference tables, all of which can easy fit on a single reference sheet. Unit stats are fairly complex however, so until you’re really familiar with your army it would be best to have a copy of the rulebook to hand. How much scenery do I need to play? DzC is designed for all sorts of battlefields, but functions best with at least partially urban areas, Indeed, many scenarios require at least 3 structures. In general though, the more the merrier! We’ve mostly been playesting with around 10 structures on the table. We will be providing high quality modular resin scenery (more on this soon! ), as well as low cost card flatpack buildings. Before these are released however, you can use model railway N-scale buildings (10mm scale is 1:188, and N is 1:200, a very close match). Also, a lot of 6-15mm scenery will often also be suitable. Rules exist for rivers, foliage, woodlands, ruins, contours and similar scenic items, so feel free to design all sorts of interesting battlefields ! What size table to I need to play? We recommend a minimum 4’x4′ table size. Much of our playtesting has been conducted with medium-large sized armies at this table size, which is usually more than sufficient. Much larger tables can be used though, and will enhance the dropship based system even further, since their greater movement speed will become even more crucial. For armies as larger than our Mega Deals, we’d recommend at least a 6’x4′ table, simply to prevent the table being too crammed with models! How does close combat work? There are no specific close combat rules in DzC, since fighting with swords is not a major feature in wars where advanced ranged weaponry is commonplace! Close combat on the open battlefield is a rare occurrence, and is absorbed in the normal shooting rules by assigning a weapon a range value of CC, which simply requires physical contact to be fired. The closest real equivalent to close combat is Close Quarter Battle (where blades, clubs and teeth may indeed be utilized!). CQB is a very important aspect of the game. Often, it becomes necessary to storm the building and enter the unforgiving world of room to room slaughter. Up close and personal, bloodshed is assured and likely to be high! This is almost always the best (and sometimes the only) practical way to dislodge/destroy enemy infantry inside a structure. Specialist troops (such as the UCM Praetorian special forces) and murderously efficient at this job! Will there be more information about the rules before launch? Certainly! To start off with, Dave will be available for live chat from 9am to 9pm GMT on Monday June 11th our facebook page. Don’t worry if you miss it though, he’ll be adding many of the key points to this FAQ after that, and will be doing other live chats in future! Also, keep an eye on the Download section for sneak peeks, battle reports, testimonials and perhaps even videos covering the rules. I will try and get you a summary of the Q&A’s from Mondays sessions with Dave, I have a few questions of my own. Well there you have it folks. Now to either resist temptation to buy a whole army, get a few miniatures to paint and review for you or wait and read the rules and then decide…? DropZone Commander – Today is the day! Site goes LIVE for pre-orders UPDATED!!! Today is the day! Site goes LIVE for pre-orders this afternoon, I am so excited! There is a buzz going around the web, I am getting emails and F5 keys are getting button-bashed all over the world! 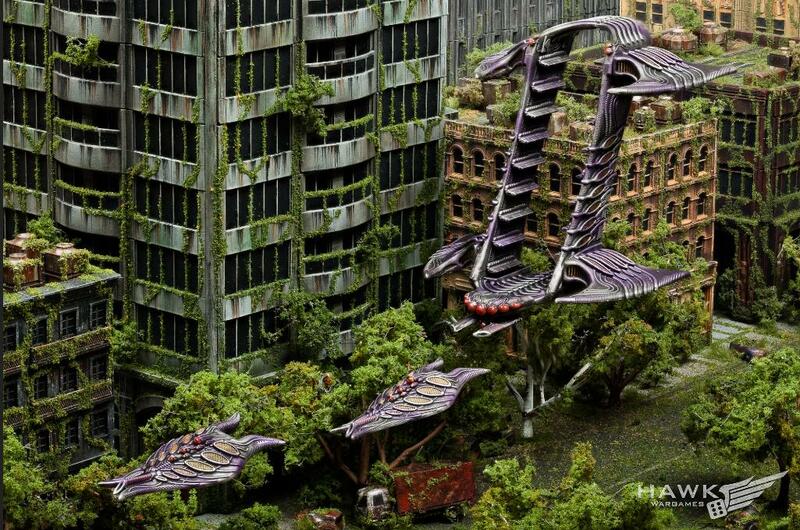 Hawk Wargames will launch its website and accept pre-orders for Dropzone Commander tomorrow afternoon, Friday 8th June. Keep an eye on facebook and twitter for up-to-date information. Following the launch, David Lewis, Director of Hawk Wargames, will be available for live discussion about the rules and miniatures via the company’s facebook page between 9 am and 9 pm on Monday 11th June. This will be a great opportunity for gamers to ask questions not answered on the site – something not to be missed! Hawk Wargames thanks everyone for their support and patience and is very pleased to announce the launch of its products, something which has been eagerly anticipated since Salute! 2012. The website will contain a wealth of information and images for all four launch fractions for Dropzone Commander, as well as rules information, FAQ’s etc. Hawk Wargames will also be adding more content to this section in particular over the coming weeks. Pre-orders of products will be possible from Friday 8th June, to ship from us on Monday, July 23rd, subject to availability. We cannot guarantee that orders placed after July 9th will ship on the specified date. Be sure to place orders early to avoid disappointment! For more information, please contact:info@hawkwargames.com after launch. Trade information and contact details will be available on the site also. Thanks again for the fantastic support and encouragement we’ve received from the gaming community! Well there you have it. We had hoped to be able to bring you some new things to look at pictures, miniatures, articles etc. We are still working hard to get those for you. Keep watching! 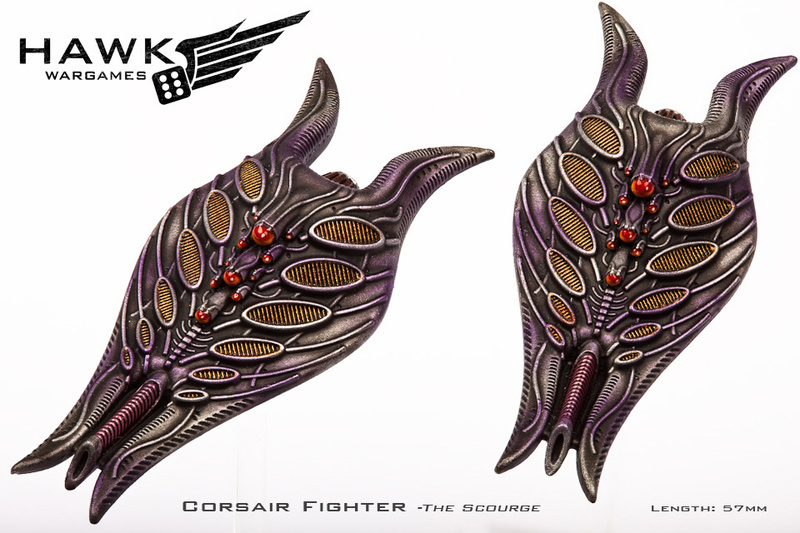 Today we have the Scourge Corsair fighter. 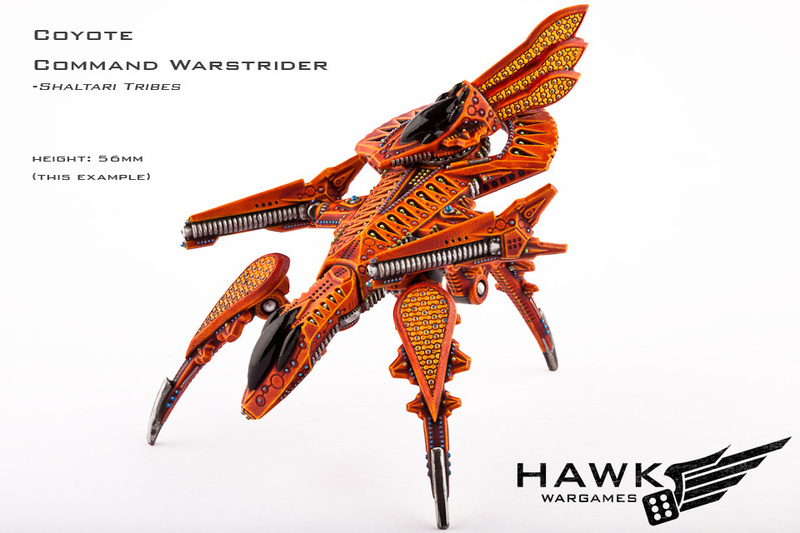 Today we have the Shaltari Coyote Command Warstrider, what an awesome looking miniature!